Winter Storm TOBY has passed through the mid-Atlantic, Northeast and New England regions. The high winds forecasted did not fully materialize which reduced the overall numbers of power outages that were anticipated. The electric sector is restoring power to their customers and all the resource needs for mutual assistance are met at this time. Many thanks to the states for supporting the mutual assistance process and fleet movements for this event. Pennsylvania has updated their travel restrictions and advisories. See below. New Jersey has issued an emergency declaration along with road/travel restrictions. Amended proclamation of disaster emergency. The proclamation is from the storms in early March and is still in effect until 3/31/2018. Waiver of utility vehicles as it pertains to commercial vehicle restrictions. A winter storm (aka Winter Storm TOBY) is moving into the mid-Atlantic, Northeast and New England regions. 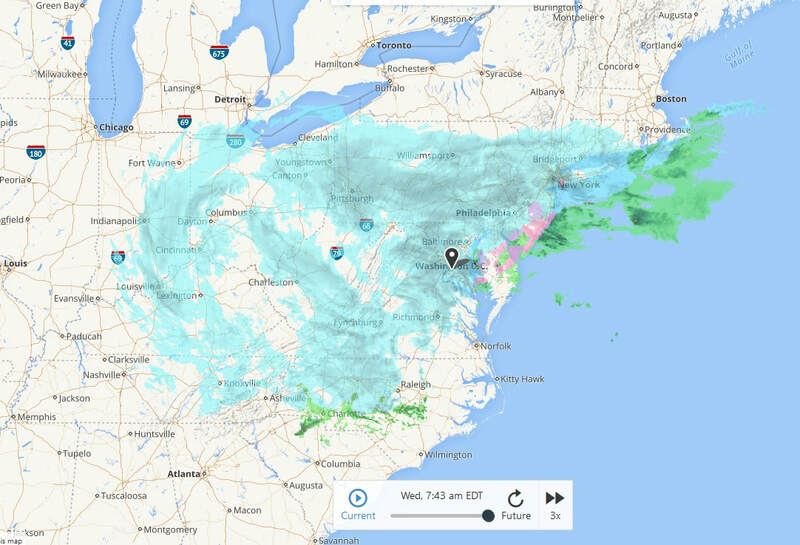 The potential for heavy wet snow, mixed in with icing, may create significant power outages from DC and the Shenandoah Valley, up through Baltimore, Philadelphia and New York. The electric sector will continue to monitor the storm through this evening. 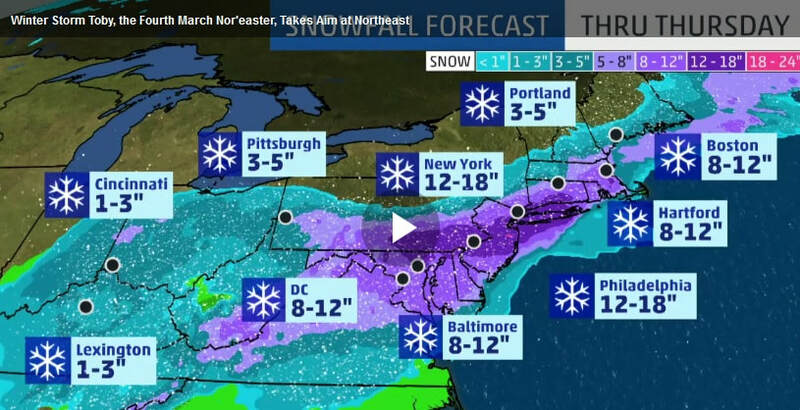 No states have issued emergency declarations as yet. Impacted states: VA, MD, DC, DE, NJ, PA, NY, CT, NH, NY, Maine, Mass at this time. As with all disasters, this information is subject to change without notice. The All Hazards Consortium, the Multi-State Fleet Response Working Group, the utilities involved, and the states, expressly disclaim any liability whatsoever, for any usage of this information by its recipient. Recipient’s usage of this data constitutes a waiver of any claim it may have with respect to its use of the data. Please consider all information operationally confidential. Pennsylvania Department of Transportation (PennDOT) and the PA Turnpike on Wednesday lifted additional restrictions from Interstates in eastern and central Pennsylvania at 8 pm. The rest of the remaining restrictions will be lifted at midnight. At 8 p.m., the overall ban on commercial vehicle restrictions came off Interstates 83 and 380, and restrictions on empty trucks, tractors pulling double trailers and trailers towed by cars and pick- up trucks also were lifted from Interstate 81 between the Maryland line and the junction of Interstates 80 and 81 in Luzerne County. A ban on commercial vehicles was lifted from Interstate 70, from the Maryland line to the Turnpike, at 4 p.m. and from Interstate 84 at 6 p.m.
Pennsylvania coordinated its actions with its counterparts in New York and New Jersey so to avoid unnecessary traffic bottlenecks across state lines. The ban and restrictions had been placed beginning at 8 p.m. Tuesday due to forecasts calling for significant snow across many areas of Pennsylvania. The truck/trailer ban was lifted on the east-west mainline (Interstate 76 and Interstates 70/76) from the Breezewood Exit (No. 161) to the Harrisburg East Exit (No. 247). The 45 mph speed-limit restriction was lifted on the east-west mainline (I-70/76) from the New Stanton Exit (No. 75) to the Breezewood Exit (No. 161). At 10 p.m. the commercial and speed restrictions will be lifted off the portion of Interstate 476, the PA Turnpike Northeastern Extension. At midnight, the commercial vehicle ban was to be lifted off Interstate 78. Also, at midnight the remaining restrictions on light vehicles and trailers will be lifted from Interstates 76, 80, 95, 176, 476 and 676 in eastern Pennsylvania, and the remaining sections of the Pennsylvania Turnpike -- Interstates 76 and 276 (the east-west mainline). Good afternoon. Please see the attached updates on road/speed restrictions. The dashboard is available to view updates and information throughout the day and download files. https://share.dhs.gov/paboc This board will be monitored through the day. You can access the site without signing in. The Pennsylvania Department of Transportation (PennDOT) on Wednesday lifted restrictions from several interstates as of 4 p.m., but left others in place. • Interstate 70, from the Maryland line to the Turnpike. • Interstate 79 from the Turnpike to Interstate 80. • Interstate 76, the Schuylkill Expressway and the East-West Turnpike mainline from Breezewood east to and Valley Forge. • Interstates 276 and 476, a portion of the mainline Turnpike between Valley Forge and the Delaware River Bridge in southeastern Pennsylvania and the entire Northeastern Extension. • Interstate 476 between the Turnpike and Interstate 95. • Interstate 80 from the New Jersey line to the junction with Interstate 81. • Interstate 81 from the Maryland line to the junction with Interstate 80. Electric utility outage sites and phone numbers to report outages. 1. Amended proclamation of disaster emergency. The proclamation is from the storms in early March and is still in effect. 2. Waiver of utility vehicles as it pertains to commercial vehicle restrictions. Pennsylvania has issued transportation guidance and restrictions. In anticipation of significant snow fall across Pennsylvania beginning Tuesday night, the Pennsylvania Department of Transportation (PennDOT) will impose a series of restrictions on most interstates beginning at 8 PM. Interstate 476 between the Turnpike and Interstate 95. Interstate 76 across the state, which includes the Schuylkill Expressway and the East-West Turnpike mainline. Interstates 276 and 476, a portion of the mainline Turnpike in southeastern Pennsylvania and the entire Northeastern Extension. Interstate 80 from the New Jersey line to the junction with Interstate 81. Interstate 81 from the Maryland line to the junction with Interstate 80. Interstate 79 from the Turnpike to Interstate 80. Interstate 70, from the Maryland line to the Turnpike. Has a gross vehicle weight rating or gross combination weight rating, or gross vehicle weight or gross combination weight, of 17,001 pounds or more, whichever is greater. Is designed or used to transport more than 8 passengers (including the driver) for compensation. Is designed or used to transport more than 15 passengers, including the driver, and is not used to transport passengers for compensation. Is transporting hazardous materials which is required to be placarded in accordance with Department regulations. Restrictions will remain in place as long as conditions warrant. As conditions develop, speed restrictions will be considered on these routes. If the forecast changes, PennDOT will quickly review and possibly adjust or lift the restrictions. If traveling during severe winter weather, motorists should make sure their gas tank is full and they pack an emergency kit, which should include non-perishable food, water, blanket, small shovel and warm clothes. Remember also any special needs, such as baby food, pet supplies or medications. When queues form and roadways are expected to be closed for long periods because of crashes and other traffic disruptions, PennDOT and the Pennsylvania Emergency Management Agency can activate the 511PAConnect system to establish contact via cellphone to trapped motorists. Motorists are reminded that roadways will not be free of snow while precipitation is falling. With freezing temperatures, roads that look wet may be icy, and extra caution is needed when approaching bridges and highway ramps where ice can form without warning. Motorists should leave plenty of space – six car lengths --- when following a truck that is plowing or spreading winter materials. Also, reduced speeds are a must when traveling during snow events. While PennDOT recommends not traveling during winter storms, motorists are encouraged to “Know Before You Go” by checking conditions on more than 40,000 roadway miles by visiting www.511PA.com. 511PA, which is free and available 24 hours a day, provides traffic delay warnings, weather forecasts, traffic speed information and access to more than 850 traffic cameras. Users can also see plow truck statuses and travel alerts along a specific route using the “Check My Route” tool. As storm conditions develop, a comprehensive commercial-vehicle ban and/or speed restrictions could be imposed across significant portions of the PA Turnpike system. Trucks already in New Jersey are encouraged to use truck stops or rest areas during the ban. In order for road crews to effectively plow, drivers should not park on shoulders. Residents and motorists should avoid driving unless you are an essential employee needed for emergency response. If you do not have to be on the roads during the storm, please stay home. If you must go out, drive slowly, fill your gas tank, charge your phone, pack blankets, water and non-perishable food items. Attached, please find the Administrative Order Travel Restriction. 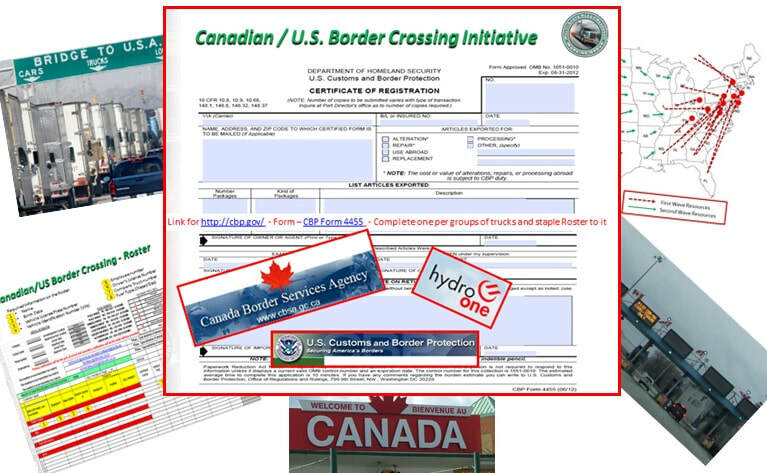 UPDATED June 2017 - Operational Guide for US/Canadian Border Crossing process designed to expedite the resource movements across the border for disaster response.